I also got some double prong hooks from Target for the back of the closet. They are perfect for all my scarves. This isn't even all of the winter scarves I own. I sort of have a sickness, I think. And here is all our stuff, back in and organized. Here's a closeup of the bamboo shoe rack. I love it, but egads what a blurry pic! It's really beautiful, and the turned-up edge is genius, your shoes can't possibly fall off. The Orla Kiely bin was put back in, all of our gloves are in there. You know, the ones that are still matching pairs. The rest of the shelf space is for Shaun's clown shoes. I love having the hooks on the side because let's face it, I'm lazy. I will definitely use them for hanging a coat or two when I don't feel like going through all that work of actually putting them on hangers. For now, more scarves!! Total: $70. Not bad for this before and after! ps - you better believe there was a trip to Goodwill after this closet redo! That is one good looking coat closet. Maybe I need to add ours to the very long to do list. Love how the closet turned out! I'm loving the hooks for the scarves, like you I have a sickness for scarves, shoes and purses. I am loving it. A little time, and lots of work turned the dark space into loveliness. I just might copy the hooks in the back of the closet idea. Great use of space. I am a hook gal too...very lazy I am. I think this might be my favorite closet redo. It looks so great. I really like all the hooks you added. I never would have thought to add them to the back wall too, but it really makes sense. Good job as usual Sara! LOVE the color of the closet! Ive been thinking about paint my upstairs room a similar color but im worried that it will look too dark up there :( I hope it turns out as beautiful as this redo! Wow, it looks great! I would have never thought to put hooks against the wall to hide your scarfs. Good Call!! What a great "After"! It's lovely. I also need a great deal of storage for my insane scarf collection- and I live in CA! Thanks for sharing all your hard work and great ideas on this project. Looks great, Sara! And I do love that paint color. It makes a big difference! You have a sickness for scarves, I have a sickness for organization and before and afters. I could seriously read about your closet all day, that's how much of a junkie I am. It looks amazing I love the color you chose and I'm most obsessed with the hidden hooks for scarves behind the coats. That is pure genius. My scarves area always all wrinkled because I just shove them in a bin. This is so much better. 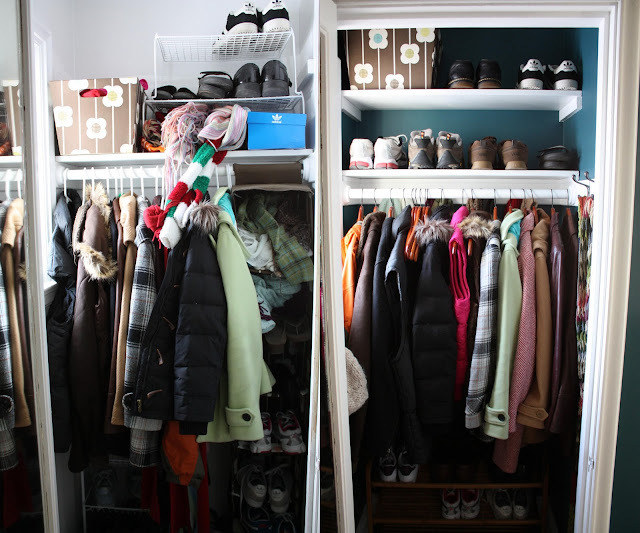 We don't have a coat closet in the new house, but I need to find a way to do this. Where's the bamboo shoe rack from? That's great. I just cried out in pain from the BEAUTY! You saw my post about closets, right? Thanks for the link, Sara! Your closet looks amazing. The closet is gorgeous! So jealous! I would love to paint my walk-in closet but there is just too much to take out. It is very organized (blogged about it - it's my happy place) but it would really be a project. Now - I really want to repaint! I did white closets because it makes sense but they are the only non-color walls in my house! Beautiful! I am following you now and will devour all the rest of your decorating I am sure. Woohoo looks great! Love the before after. Let's hope it stays so neat! Wishful thinking in my house that's for sure. Excellent - I wish any of our closets looked this good! Wow - that turned out fantastic! You did a great job! Love it! Oh man, I am totally regretting painting my closet interior white. This looks amazing! 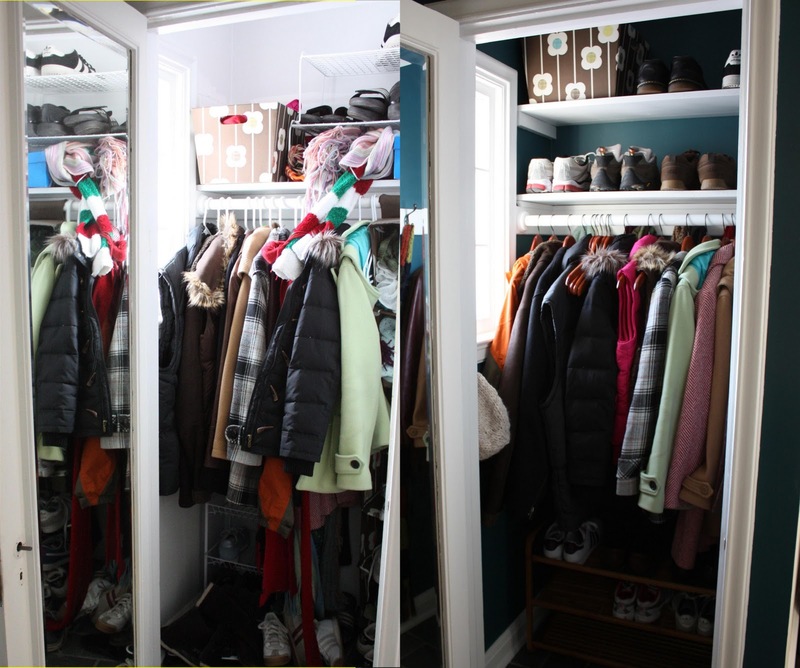 I think I get high off of closet makeovers. And you are the closet queen! Looks so good! Great job. OMG, your paint color is GORGEOUS. I wouldn't want to fill the closet, either! a perfect closet! love the color! Excellent idea! I love the various hooks. We're working on one of our rooms now and I haven't decided what to do about the closet yet and this idea is perfect. Awesome before and after! I need to get myself some of those double prong hooks! (we have some, but like you, I have a scarf sickness and could always use more)! Would you believe I have the EXACT SAME scarf as you? It's the green bendy one that I think is from Target. I don't know if bendy is the right term, but I think you'll know which I mean. My friend got it for me as a present one year....I love it!!! There is so much going on here that I don't know where to start. Bottom line - It Is Awesome!! It looks great, Sara! I love the color with the white trim. Plus that darker hue will be sure to hide any marks from hangers, shoes, etc. A good pick! This is great! I really love the scarf storage idea! Very very nice! I love that you have the hooks on the side for when you're too lazy to hang the coats up. haha. It happens! LOVE that colour. Thank you for linking to the shoe rack. I have seen similar ones else where but had no idea where to find it. I blatantly copied...um, I mean was inspired by this closet & bought the shoe rack from Amazon. It is awesome & makes me happy every time I open my closet. Thanks for yet another great idea. Wow, it looks awosome! I would have never thought to put hooks against the wall to hide your scarfs. Everything has been arranged neatly shoes, clothing, scrafs. And I like the color of the closet perfect for any bedroom/.